'Conduct unbecoming' might be a more apt title to the slanging matches and feud which waged between two of the leading safemakers, Thomas Milner and George Price in the 1850's. What started it is uncertain but it probably came about from the publication of George Price's Treatise on Fire and Thief-Proof Depositories and Locks and Keys. 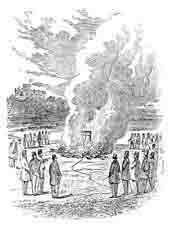 This 1,000 page book which was published in 1856 included many testimonials on the results of fire tests including those of his main competitor, Thomas Milner. Price suggested that some of the testimony regarding the fire-resisting potential of Milner's safes was false, making erroneous statements and full of contradictions, misrepresentations, and mistruths. Apart from this Milner must also have bristled at the fact that Price's safes now incorporated Milner's recently expired patent for steam-generating fire-resisting compound. When Price was about to hold an auction of his latest range of safes in Manchester in 1855, a horse-drawn lorry appeared outside the saleroom entrance on which stood one of Milner's best "Strong Holdfast Safes" in mint condition, alongside which stood one of Price's safes - totally mutilated. According to Price the safe had been dismembered at Milner's factory in Liverpool. It was subsequently placed on display in the window of Milner's depot in Manchester. Then followed a series of challenges for public testing of safes against both fire and force culminating in what became known as the infamous Burnley test. For this test George Price offered up two of his best safes which were available to any member of the public to attempt. Because of what he called manufacturing errors Price temporarily withdrew his safes as he felt that they were capable of taking too large a charge of gunpowder. Then, on the 30th. of April 1860 the second test took place on which occasion Milners turned up with a safe of their own which they wished to have included in the test. Mr.Freestone, a pawnbroker from Nottingham who apparently bore some grudge against Price appeared from the crowd with all the necessary gunpowder and made to place his charge. This he failed to do as the lock would not contain the amount of gunpowder he had expected. 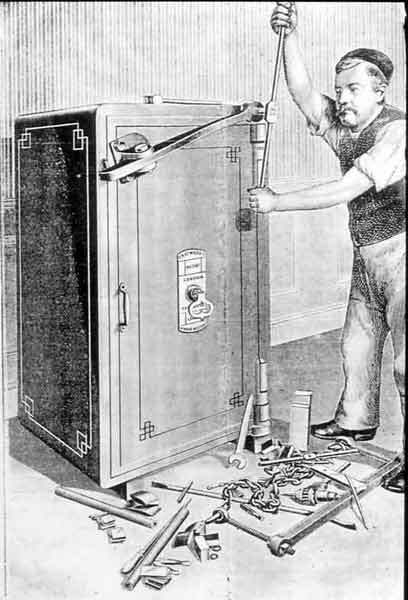 Milner's safe was then prepared by Price's assistant, the resultant explosion blowing the door entirely off its hinges. Although fitted with the 'double patent gunpowder-proof solid lock', a hole had been drilled through the door plate in just over seven minutes and through which about 12 ounces of powder was poured into the cavity of the wooden filling which accommodated the movement of the main bolts. Milners men then attempted to drill through the door of Price's safe with an elaborate mechanism attached around the body of the safe. This also met with failure as did the attempt to dislodge the case-hardened spindle in an attempt to find access for another charge of gunpowder. As the trial had ended, Price and his men left the ground at which point Milner's men produced an old model double-door Price safe which had been made five years earlier and which incorporated none of the recent improvements. The lock of this safe which had no provision for limiting the amount of charge seems to have been pre-packed with gunpowder and taken back into the yard while the crowd was dispersing. The charge was indeed excessive and the safe disintigrated. The remaining crowd had only been expecting an explosion similar to that which had opened the Milner and had taken no additional steps to protect themselves. As a result of this irresponsible act, a young boy was struck by a piece of the safe and killed. Although Price and Milner were said to be full of remorse, little subsequently changed in their attitude to each other. While there are no doubt many other examples of ungentlemanly conduct in the industry, the case of Ratcliff & Horner versus Samuel Chatwood of Chatwood Patent Safe and Lock Company is worthy of note. Ratcliff & Horner, the last prominent safemaker to be founded in the 19th.Century, was started in 1888 by Daniel Ratcliff, Milner's son-in-law, and Douglas Horner Milner's Works Manager. They brought with them from Liverpool experienced safe engineers and opened their factory in Bromley-by Bow, East London. The name was changed to Ratner in 1895. Their thief-resisting safe stated on the door that it was made of 'Hardened Congreave Safe Steel' which was absolutely undrillable. It appears that Chatwoods managed to drill the door of such a safe to which Ratcliff & Horner responded by saying that they must have pre-softened the plate by heat before drilling. This eventually ended up in December 1892 in the High Court of Justice which found for the defendents Chatwood, awarding costs of £600. Ratcliff & Horner responded with an attack on one of Chatwood's best quality safes and printed the results for distribution to their agents. Opened by forcing screw in less than three hours,without noise. The attached woodcut was taken from a photo representing a Chatwood Safe opened by forcing screw. This safe was purchased direct from Chatwood Safe Co.early last year. It was a List 5 Quality and measured 28"x22"x22" outside and this small safe cost £36. 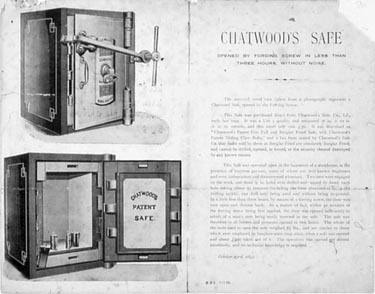 It was described as a Chatwood Patent Fire Fall and Burglarproof safe with Chatwood Patent Sliding Claw Bolts and has been stated by Chatwood Safe Company that safes sold by them as Burglar Proof are absolutely Burglar Proof and cannot be drilled, opened, or forced, or the security thereof destroyed by any known means. This safe was operated upon in the basement of a warehouse in the presence of fourteen persons, some of whom are well known engineers and are independent and disinterested witnesses. Two men were engaged in the work and three 3/4"holes were drilled and tapped by hand, each hole taking about 20 minutes including the time allotted to fixing the drilling tackle, one drill only being used and without being reground. In little less than 3 hours, by means of a forcing screw, the door was torn open and thrown back. As a matter of fact,within 42 minutes of the forcing screw being applied, the door was opened sufficiently to admit of a man's arm being easily inserted in the safe. The safe was therefore to all intents and purposes opened in 2 hours. The whole of the tools used to open the safe weighed 85 lbs. and are similar to those which were employed by burglars some time since, when a safe was opened and almost £400 taken out of it. The operation was carried out almost noiselessly and no technical knowledge required. Chatwood, not surprisingly, took steps to minimise the effects of the above by testing and publicising their own more up-to-date model as shown below. Unfortunately their report and timings are not available but it would not be surprising to learn that they failed to effect an opening of the door. It is likely that in this more up-to-date model, wrought iron had been replaced by steel. The loose tools scattered in front of the safe comprise the ratchet drill with attachments to bore the fixing holes which in turn would be tapped to take the attaching bolts for the forcing screw. There is also a large selection of steel wedges which would have been applied in increasing thickness to any gaps created to assist the extraction of the door. This unique tool was also known in France where it was called 'le pont'. A method similar to this has been used in recent years later using a combination of electric-arc welding and hydraulic jacks. Straightforward challenges between manufacturers were not unknown as in the case of Silas C. Herring and Samuel Chatwood at the Paris Exhibition of 1867 but even this turned out to have more than its fair share of dirty tricks and devious practices. The full story is on the next page.